The fraudulent conversion to one's own use of goods or money entrusted to one's care and control. The offense differs from theft in that in the latter the possession itself is unlawful. The Mosaic law provides a penalty for embezzlement in a very restricted case. Lev. v. 20-26 (A. V. vi. 2-7) deals with several forms of dishonesty; e.g., where a man denies to his neighbor goods or money entrusted to him, or something robbed or wrongfully withheld, or goods lost by his neighbor and found by him, and where he has, moreover, taken an oath to his false denial. He is then required to make restoration in full, to add one-fifth in value to the principal, and to bring, moreover, a ram without blemish as a guilt-offering to the priest, who thereupon shall make atonement, and the sin shall be forgiven. 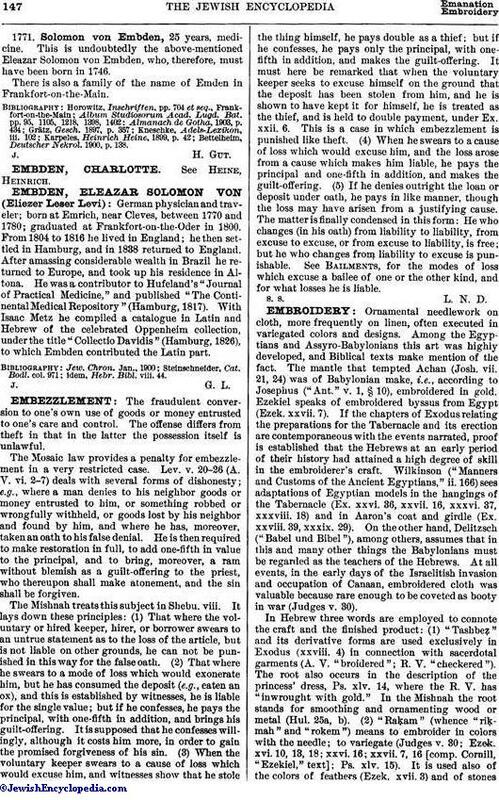 The Mishnah treats this subject in Shebu. viii. It lays down these principles: (1) That where the voluntary or hired keeper, hirer, or borrower swears to an untrue statement as to the loss of the article, but is not liable on other grounds, he can not be punished in this way for the false oath. (2) That where he swears to a mode of loss which would exonerate him, but he has consumed the deposit (e.g., eaten an ox), and this is established by witnesses, he is liable for the single value; but if he confesses, he pays the principal, with one-fifth in addition, and brings his guilt-offering. It is supposed that he confesses willingly, although it costs him more, in order to gain the promised forgiveness of his sin. (3) When the voluntary keeper swears to a cause of loss which would excuse him, and witnesses show that he stole the thing himself, he pays double as a thief; but if he confesses, he pays only the principal, with one-fifth in addition, and makes the guilt-offering. It must here be remarked that when the voluntary keeper seeks to excuse himself on the ground that the deposit has been stolen from him, and he is shown to have kept it for himself, he is treated as the thief, and is held to double payment, under Ex. xxii. 6. This is a case in which embezzlement is punished like theft. (4) When he swears to a cause of loss which would excuse him, and the loss arose from a cause which makes him liable, he pays the principal and one-fifth in addition, and makes the guilt-offering. (5) If he denies outright the loan or deposit under oath, he pays in like manner, though the loss may have arisen from a justifying cause. The matter is finally condensed in this form: He who changes (in his oath) from liability to liability, from excuse to excuse, or from excuse to liability, is free; but he who changes from liability to excuse is punishable. See Bailments, for the modes of loss which excuse a bailee of one or the other kind, and for what losses he is liable.